You do need a car to get out & about to make the most of being there ideally. Mark Pope on 06 49 49 92 13 has 6 seater based in Duras. Mark knows our place well so do give him a call. It's about 25 Euros into Eymet and 35 Euros into Bergerac. For day to day top up food there is a co-op type shop and a boulangerie in Bouniagues which is just 3 miles away. The co-op (called Proxi ) is open Mon to Sat 07:30 to 19:30 and Sunday 08:30 to 12:30) The boulangerie is similar but closes for lunch. 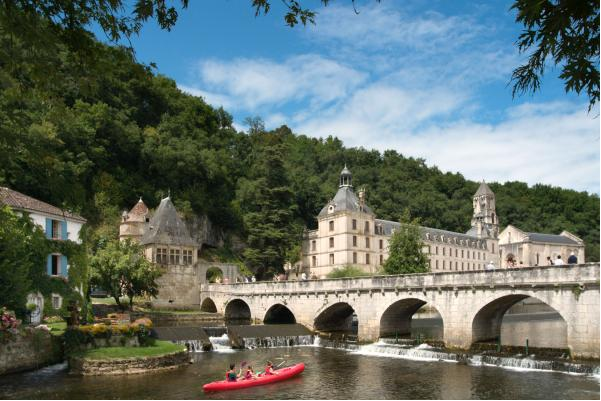 However, it's the peace and quiet which attracted us here and we think our surrounding area is the prettiest part of the Dogdogne, away from the forests we are amid the rolling countryside of vineyards and sunflower fields. The area is bright and open and gives a feeling of space and relaxation. One of things which attracted us to the area is the abundance of birds and wildlife, with lovely walks directly from the property. In deepest France, Anthony Peregrine knows where to go for castles, cave art and lunch...click below for the whole guide. We highly recommend a wine tasting trip to the local Vineyards and the Domaine Du Siorac is a must to visit and just round the corner ! The local French markets are a must see during your stay. After a trip to the local market in the morning, what not spend the afternoon stuck into a good book by the pool. Not to be missed is the world famous St Emilion, just a short drive away. A designated world heritage site and is truly stunning. Explore characteristic narrow lanes lined with wine merchants, cafes, restaurants and interesting independent shops. A guided tour of the monolithic church is highly recommended. The village centre is well worth exploring, with the straight streets lined with medieval houses in stone and colombage. Some of the houses bear fascinating ancient carvings and engravings, and many of the houses in the central square, called the Place Gambetta, still have the medieval arcades at ground floor level that once provided shelter to the market traders. Lauzun is a small town in the northern Lot-et-Garonne between Eymet and Castillones (south of Bergerac), where it is one of several towns spread along the Dropt Valley. Although small, Lauzun is a pleasant town to explore, with some attractive medieval houses to admire in the centre and the surrounding streets before strolling up to the castle. The most interesting house is perhaps is the 'House of the Caryatids' with four statues behind a wrought-iron balcony and an ornate roof line. Lauzun market is on Sunday mornings. Bergerac is a town on the northern bank of the Dordogne River and in the western part of the Dordogne department. It is one of the largest, most important towns in the region and has several highlights including an extensive medieval centre and a visit is highly recommended. There are a number of museums to visit such as the Tobacco museum and the National Wine and River Navigation Museum. There are organised boat trips up the river (start from the car-park at the bottom end of the old-town) to see the town and the nearby countryside from a different perspective. About 3km north of the town centre and on the edge of Bergerac there is a large area called Pombonne Park. Here you will find trees and nature trails as well as a lake with a small sandy beach. 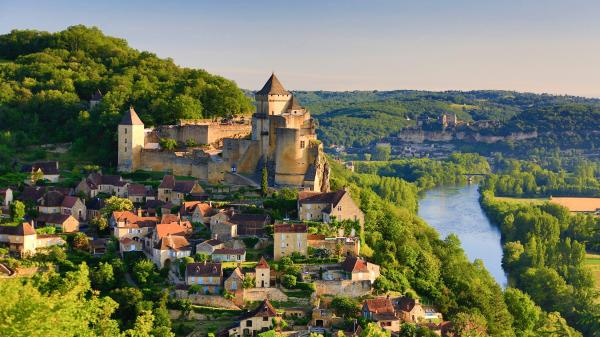 A pleasant town, Duras has one main sight that attracts visitors: the Chateau de Duras. There is also a medieval clock-tower, and a sprinkling of attractive houses to enjoy while exploring, and the impressive Maison des Vins commemorating the highly regarded wines of the region. The chocolate factory has a shop there and it packed full of delights from shabby chic accessories to delicious treats ! Duras castle was originally built in the 12th century, the chateau de Duras was fortified in the early 14th century, then subsequently transformed in the 17th century into accommodation more suited to residential use, with many luxurious touches being added in the process. As with many French castles it suffered important damage at the time of the revolution, but the second half of the 20th century has seen the castle substantially renovated. The area has a temperate climate, and enjoys relatively mild winters with long spring and autumn seasons. The summers here can be very hot and dry, ideal for sun lovers. Out of high season the weather is often pleasantly warm, making the area an excellent choice for a relaxing holiday in or out of season.